“Cabinet of Curiosity: Drexel’s Rare and Unusual Collections” marks the first time in Drexel history that an art exhibit has featured the skull of conjoined calves, a 19th century medical amputation kit and a silver spoon commemorating the Salem Witch Trials. A skull of conjoined calves. If the exhibit seems atypical, it’s because the collection’s assortment of over thirty miscellaneous knickknacks is also irregular. The items from The Drexel Collection, Drexel University’s College of Medicine and the Academy of Natural Sciences are considered “rare and unusual” because they are unusually remarkable in their own right or were acquired outside their respective collections’ parameters. It’s no surprise that the College of Medicine held on to items related to the medical field, such as the medical amputation kit and a 19th century scarifcator, a bloodletting device used to bleed patients. But the exhibit also features College of Medicine artifacts that wouldn’t necessarily be expected to be housed by a medical school, like a Chinese Chueh-libation cup used to offer alcoholic drinks to the gods and the Kartika of the Deities, a Buddhist crescent knife symbolizing the severance of all material and worldly bonds. One of the oldest trinkets in the exhibition survived the ancient volcanic eruption that destroyed the Roman city of Pompeii in 79 A.D. The oyster shell ended up at Drexel when the University’s first president, James A. MacAlister, returned from a European trip where he purchased over one million dollars’ worth of sculptures, porcelain and art to start The Drexel Collection. Somehow, over the years, the archive known for its 19th century European art also gathered a 20th century Indian incense burner shaped like a head. The exhibit also showcases not one but two different skulls—one of which contains two mouths and two faces in a single cranium. 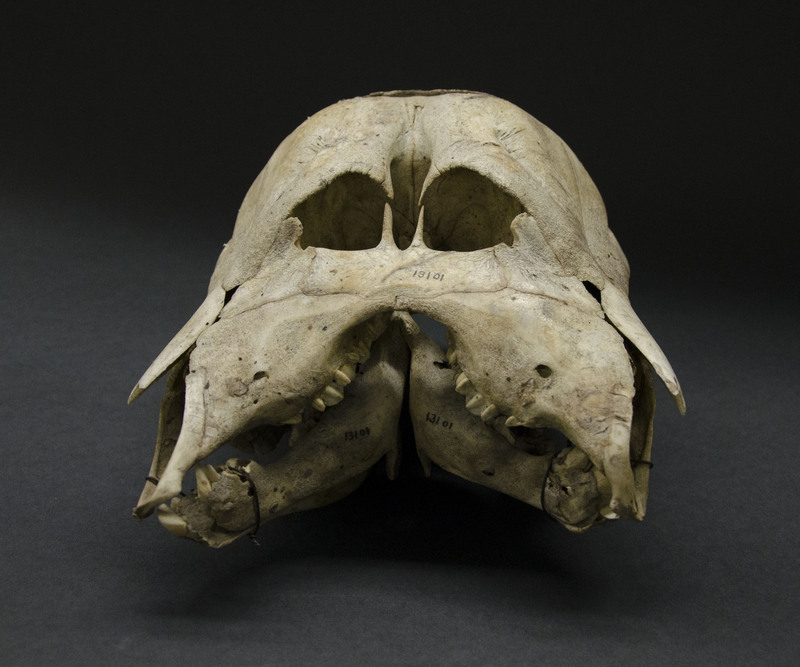 The skull of conjoined calves came from a newborn cow collected by the Academy of Natural Sciences’ mammalogy collection. Another gruesome animal donation from the Academy is the aptly named “Frankensquid,” a specimen of the Orangeback flying squid that was dissected and then put back together with incorrectly attached parts. A mask from Bangkok, Thailand made of decorative gilt with inlay of stones. A giant isotope from the Gulf of Mexico. The Kartika of the Deities. A buffalo horn in the shape of an eagle. A wooden mask from Mexico. Curators from the College of Medicine and the Academy of Natural Sciences worked with Jacqueline DeGroff, the curator of The Drexel Collection, to select items for the show. Their interdisciplinary collaboration created what DeGroff said was one of The Drexel Collection’s most popular exhibitions. “Cabinet of Curiosity: Drexel’s Rare and Unusual Collections” will be on display until December 13, 2013 in Rincliffe Gallery on the third floor of Main Building (3141 Chestnut St.). It will be open 8 a.m. to 8:30 p.m. on weekdays and 9 a.m. to 5 p.m. on weekends. For more information, please contact: Jacqueline DeGroff, Curator, The Drexel Collection, 215-895-0480, degroff@drexel.edu.